"Camille and Gabrielle Dareau have been pupils of mine for many years. Their work has always been inspired by and devoted to the classical ideals." "My goodness - what a change has taken place in my riding. I think that I'm starting to sit 'into' the horse rather than on top of him. I felt my horse's movements in a way that has almost never happened before. The most amazing thing was his canter, my horse and I have always had canter issues ... he has so much motion that, like sitting trot, his canter has been difficult for me to ride smoothly. But I seem to have gotten so balanced that each time I asked, he slid right into the loveliest, smoothest canter you can imagine, and I was with his motion the entire time. The same with sitting trot. I could feel his gratitude - he seemed to be saying 'thank goodness you finally got it!' Many, many thanks for your help." "Thank you so much for my warm welcome. It's a great gift you have, Camille and Gaby - your way with the horses. Thank you for sharing this. Gaby, thank you for your patience teaching me. Each lesson has been amazing. This week has been wonderfully profound for me - beautiful. I can't wait to come back!" "Camille and Gabrielle supply the most wonderful eclectic selection of horses, each one relaxed, kind and expressive. The Dareau's seems to be a place where each soul gets a chance to shine. My girls had a wonderful time and eagerly awaited their lessons each morning. I was just as eager and felt entirely secure being lunged on a lovely pony that was so responsive that she asked more of me each day and didn't let me get away with any backsliding! We will be going back - it's not just the Strada saddles, the barefoot horses, and the weather; there is a Je ne sais quoi that puts Picoyne in your heart." "This holiday has been more than I hoped for. The riding instruction is outstanding, if instructors in the UK taught this way there would be a lot of happy riders and horses. Everything has been lovely, it's a very special place, which I fully intend to return to." "The riding tuition exceeded my hopes and expectations by a long way; giving me an exciting new facet to horsemanship which is lighter. more subtle, more elegant and more meaningful. It is as if a new door has opened bringing more sunlight and air. I hope to come back to enjoy again the very warm welcome also." "A wonderful holiday in the loveliest part of France. 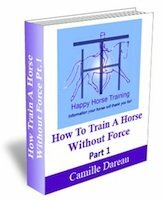 Thanks for the welcome, accommodation, and Gabrielle's superb riding tuition"
"I cannot speak highly enough of Camille Dareau as a riding instructor, she is a very thoughtful and thorough teacher. She is sympathetic and encouraging, and at the same time uncompromising and systematic in her approach to schooling. She inspires confidence, has a calm manner and is a very good communicator. I never felt under pressure during my lessons, but always felt I had made progress by the end." "I employed Miss Dareau regularly to teach my horse and myself the basics of Classical equitation. Prior to this I had received lessons from a number of different instructors and had been dissatisfied with their ability to cope with questions, adapt to my learning style and create a positive learning environment for my horse and myself. Camille was flexible and adaptable enough to help me understand the concepts, adapt my posture and apply the learning. She helped and advised me on wider horse management issues too such as feeding, saddles and Cranio-Sacral treatments." "I have been lucky enough to have had lessons from Camille Dareau, and can honestly say that she was the best riding instructor I ever had. She not only boosted my lacking self-confidence, but she improved my riding style and posture. When riding today I still remember her lessons with me and know that I am a far better rider because of her. I am of the opinion that Camille Dareau has been blessed with a special gift, and that anyone who is lucky enough to be taught by her will feel equally privileged." One of life's truly happy moments, Gaby's professional and caring manner, her ability to teach me to ride by developing a way of using mind and body together was awesome, she gave me a wealth of information which I hope I can continue to put into practice. Watching Gaby and Camille working with the horses was enchanting. Thanks to everyone for all your help and generosity, we so much enjoyed our stay, looking forwards to our return. 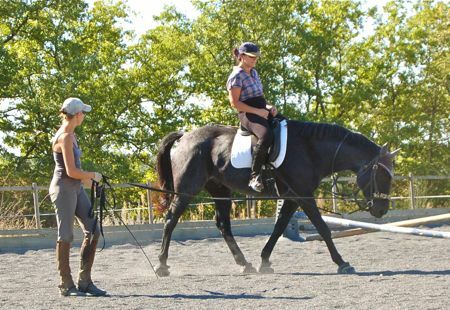 "I have had the pleasure of knowing Camille as a riding instructor for the past eight years. She has been very knowledgable and empathetic in all riding disciplines. 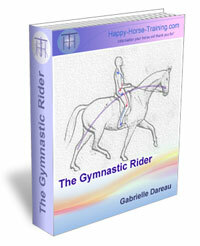 Another skill is Craniosacral Therapy which she is able to carry out on the horse and rider. 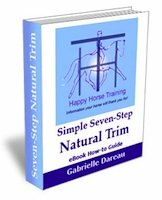 often the 'problem horse' becomes a pain-free, elegant, relaxed ride with her treatment. The rider also benefits. I have had one horse held back due to mismanagement elsewhere. he is now a relaxed gentleman with character. I have also bought a young horse trained by Gabrielle. The horse has given me great confidence in myself and my abilities." 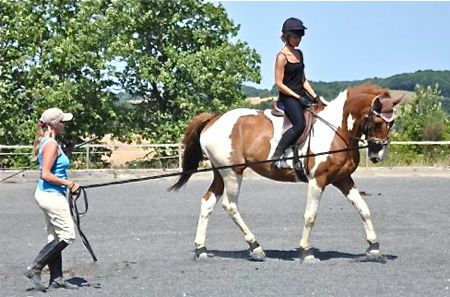 "Tranquility, sunshine and high quality riding tuition - just what I needed! Thank you to everyone - two and four-legged - for a wonderful holiday." Click on the link to read more about us.